Detroit — Giffels Webster, a Detroit-headquartered consulting firm specializing in infrastructure and land development solutions for public, private and institutional clients, is introducing three new web tools that make the community planning process easier for citizens, developers and municipal officials. Interactive zoning maps that make valuable zoning information accessible to anyone with internet access. 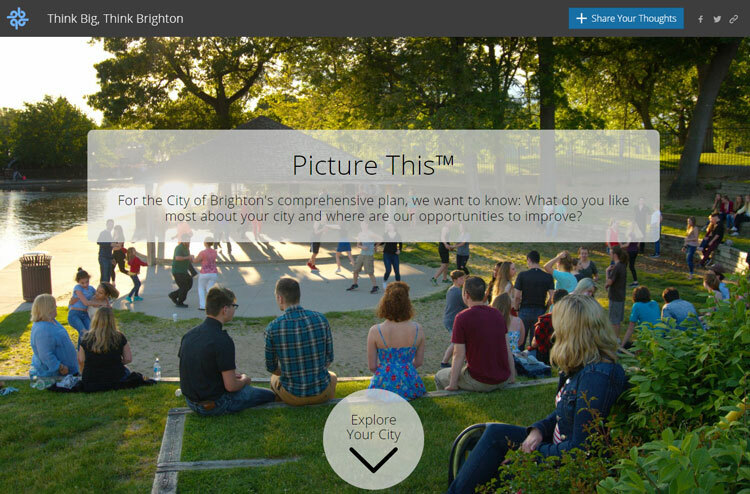 Implemented earlier this year in the city of Brighton and DeWitt Township, Mich., Picture This enables residents to take photos, upload them to an interactive community map, and pin comments about why and how those places matter. It can be accessed from computers, smart phones and tablets. Before the introduction of the platform, citizens did not have this type of convenient method to provide their feedback about parks, streetscapes, land use, development and more. Since the program was introduced, both Brighton and DeWitt Township have seen positive engagement from the community. In fact, data gleaned from Picture This will be incorporated into the comprehensive plan for both communities. Giffels Webster plans to roll out the tool to other participating communities, including Ann Arbor and Rochester Hills, Mich.
Giffels Webster recently assisted Grand Blanc Township, Mich., with online property marketing for the township’s exciting Technology Village concept. Working with Esri, a GIS mapping software platform, Giffels Webster created a web video and website offering a complete property description, including conceptual development and market information. Giffels Webster recently released a new interactive zoning map, which stems from last year’s acquisition of Clearzoning. The map is initially being tested in Lathrup Village, Mich., and then will be rolled out to other communities. The interactive zoning map is an extension of Giffels Webster’s Clearzoning capabilities. When the user selects a parcel and clicks “Clearzone It!,” they receive information about local zoning ordinances and property information. The tool is especially useful for builders and municipal officials to store, track and discover zoning data essential to a community. Also, residents can use the tool to check how the zoning laws might affect their home construction projects. “Interactive zoning maps offer a far easier, interactive alternative to the old way of obtaining zoning information, which meant first using a paper map and then digging through pages and pages of regulations to find basic information,” said Arroyo. “Interactive zoning maps offer a user-friendly alternative that is available around the clock and around the world. In a matter of seconds, users can learn a property’s zoning classification and important setback, height and siting regulations. Going forward, Giffels Webster will continue developing additional online planning tools with the help of its outstanding planning and GIS teams.